Cameo-pink, bomb-type double, very fragrant, midseason, 32" tall, lactiflora. 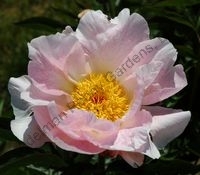 Striking pastel pink with a narrow band of ivory petals at the base. Charming! APS Gold Medal Award 2005. Award of Landscape Merit 2010. 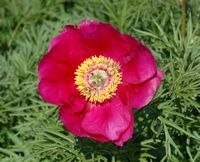 Pink, anemone, midseason, light fragrance, 24" tall, lactiflora. 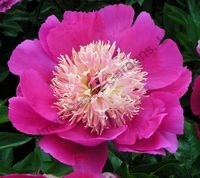 Brilliant pink flowers with serrated center petals cutely bunched together. Pink, Japanese, very fragrant, midseason, 32" tall, lactiflora. 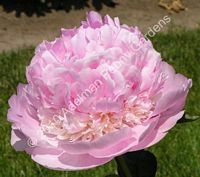 Pink outer petals surround a center of creamy staminodes. Ours frequently has a fountain of deep rose petals bursting from center! 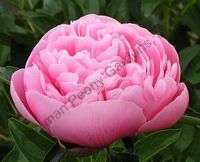 Pink, double, midseason, very fragrant, 32" tall, hybrid. 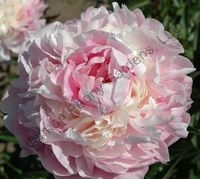 Petals of uniform size give a carnation appearance. Wonderful spicy fragrance. Unusual bud turns into a swan. Pink, double, late, very fragrant, 34" tall, lactiflora. 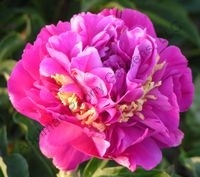 A romantically fragrant bloom of pink interspersed with creamy petals. Salmon-pink, single, midseason, 36" tall, lactiflora. Delicately colored salmon petals seem to float as if being lifted by a light breeze. Pink, japanese, mid-season, fragrant, 32" tall, lactiflora. 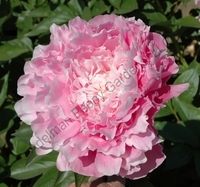 A creamy white lacy center is surrounded by two rows of large raspberry pink petals. Nature blended the color tones perfectly! Pink, Japanese, lightly fragrant, midseason, 36" tall, lactiflora. 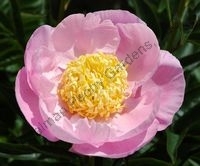 Cherry-pink petals surround a delicate, lacy center of 'shredded' yellow and pink minature petals. 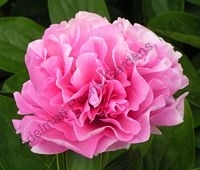 Deep rose, semi-double, early, 24" tall, hybrid. Lovely deep rose colored cupped flowers. APS Gold Medal winner 1980. A sought-after color! Award of Landscape Merit 2009. Rose pink, single, lightly fragrant, midseason, 34" tall, lactiflora cultivar. 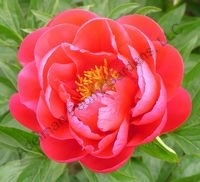 Striking bright pink single with a glowing yellow center. Stands tall in the rain. A row in bloom makes a sea of warm pink! 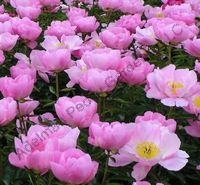 Pink, double, fragrant, midseason, 36" tall, lactiflora. 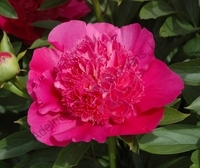 A deep pink double with a collar of smaller ivory petals at the base. A very old, tried and true variety with a bonus of fragrance! Sharp pink, semi-double, midseason, 33" tall, hybrid. 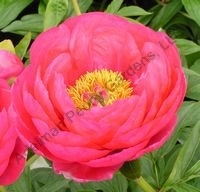 Sharp pink semi-double with many stems and many flowers. Can tolerate some shade. Award of Landscape Merit 2009. Salmon-pink, double, lightly fragrant, midseason, 34" tall, hybrid. A very symmetrical petal arrangement with depth of color to the center. APS Gold Medal Award 2002. Rose-pink, Japanese, midseason, 32" tall, lactiflora. 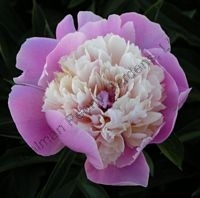 Unusual shaped bloom with a pouf of slightly lighter pink petals out of the center surrounded by golden staminodes. A real charmer! Magenta, single, very early, 24" tall, hybrid. The fern-type foliage is a wonderful compliment to the landscape. Pink, double, late midseason, light fragrance, 34" tall, lactiflora. Given to us by Nick Friend, a seedling in his field. Would be a wonderful gift for a friend! 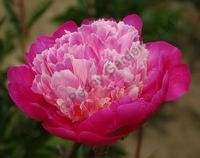 Pink, Japanese, lightly fragrant, midseason, 30" tall, hybrid. 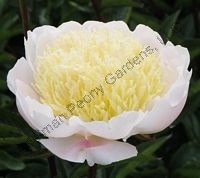 Soft pink luminous petals cup the pale yellow lacy center. Abundant fragrant flowers that stand up well in wet weather. Cerise pink, japanese, lightly fragrant, midseason, 33" tall, lactiflora. Bright pink guard petals surround a full center of mixed pink and creamy white petaloids. Very cheerful combination.